Looking back at our 25-year journey, I can relate to the maxim ‘Good things don’t come easy.’ We have had our share of trials and tribulations throughout, which made the journey exhilarating. Starting with the longwinded process of leasing a transponder for the launch of our first channel, to constantly contending with peers with immense financial resources, there has seldom been a day without a challenge. However, each impediment made us even more determined to succeed. On 2nd October 1992, when we uplinked content to satellite from Hong Kong, marking the birth of ZEEL and private broadcasting in India, little did we know that 25 years later, we would have grown into a multi-faceted global entertainment content company. From struggling to produce two hours of content in the initial days, to shaping the media and entertainment (M&E) landscape of the country, our growth story is truly a remarkable one. At ZEEL, we have been on a continuous 12 path of evolution to create rich and engaging content in twenty-one languages for our 1.3 billion strong audience around the world. However, our story would be remiss without acknowledging the vital role played by the other stakeholders in our success. We would not have been able to create the impact we did without the invaluable contributions of our employees, creative partners, distributors, peers, shareholders, and countless others who have worked behind the scenes. We firmly believe that when we collaborate with each other, our individual strengths get amplified to become greater than the sum of its parts. 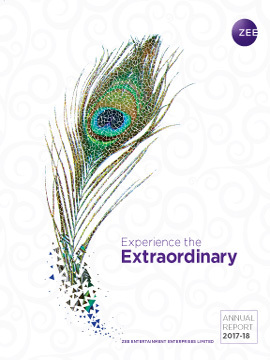 Our new ideology of ‘Extraordinary Together ’ subsumes our longstanding philosophy of ‘Vasudhaiva Kutumbakam - the world is one family’, and celebrates this journey of collaborating with our partners, within and outside, to create and deliver extraordinary entertainment. The year 1992 was also a momentous year for the country, being the first year when India fully embraced liberalised markets. Liberalisation acted as a catalyst for enterprising Indians, allowing them to unleash their potential. Ours is one such story. Since then, the unstoppable entrepreneurial spirit of Indians has taken the economy, as well as the M&E industry to heights that were hitherto unimaginable. Over this period, the Indian economy has grown ten-fold to become worth $3 trillion. Similarly, television households have multiplied by six times, FM radio has reached more than ninety cities, the movie industry has grown manifold in size, and now digital content consumption has exploded. With tax reform measures, investments in infrastructure development, and increasing ease of doing business, the pace of economic growth will only accelerate. We believe that this will have a multiplier effect on the growth of Indian M&E industry as well. It amazes me to see how the entertainment industry has changed, year after year.Before private broadcasting, the only option consumers had was the state-owned television, which was primarily an infotainment medium. However, the aspiring audience sought better quality and variety of entertainment, and we stepped up to address this need. Since then there has been no looking back. Our expansion into genres, formats, and platforms will continue, with content as the cornerstone of our strategy. While viewing preferences may evolve or new platforms for consumption may emerge, our commitment towards creating extraordinary content is eternal. On 2nd October 1992, when we uplinked content to satellite from Hong Kong, marking the birth of ZEEL and private broadcasting in India, little did we know that 25 years later, we would have grown into a multi-faceted global entertainment content company. Content innovation has been the norm in entertainment, but technology is adding a new dimension to the consumer experience. The future of entertainment holds extraordinary possibilities to create immersive experiences for every individual with the help of technology. The launch of ZEE5 is an important step in this direction. It has been built with a singleminded focus to cater to the varied needs of all audience segments with features that enrich the viewing experience. We are confident that it will significantly improve our competitive edge on the digital front. It is heartening to see that our television network is the number one in the twenty-fifth year of operations. It is a testament to the efforts of everyone who has worked towards making our network the first choice of the consumers. Our international business has continued to expand its reach and consolidate its position. We are also pleased with the progress of Zee Studios and Zee Music Company. Within a short timeframe, both these brands have marked their presence, withstanding the challenge from established players. Zee Live, the youngest member of our family, continues to ramp up its operations, adding another touchpoint for consumers. In the first half, the industry growth was negatively affected due to some macroeconomic factors. However, one may not realise that looking at our performance. Our strategy continues to deliver long-term success, which is reflected in 13% revenue CAGR and 17% EBITDA CAGR over the last five years. We believe that our robust value system is the invisible force driving the strong operating and financial performance. It provides a solid foundation for success in the ever-changing environment. While our 'Customer First' approach helps us anticipate and cater to needs of all our stakeholders in the best possible fashion, our pursuit of ‘Big, Hairy, Audacious Goals' ensures that we never settle for anything less than the extraordinary. While we dream big, we also know that to truly succeed, we must ‘Be Frugal.'' This guiding principle helps us make the most of our resources while delivering top-notch entertainment with ‘Speed & Agility.’ Our growth hinges on the ability to be sensitive to continuous changes and steer our path accordingly. At ZEEL, everyone is encouraged to 'Solve Big Problems' in order to achieve their true potential. Furthermore, we have a culture that promotes 'Accountability for Results', driving the entrepreneurial spirit. We believe that being humble about our successes and failures is what helps us constantly improve and raise the bar. Today, with over 3,000 employees, ‘Respect, Humility and Integrity’ are fundamental to what we do. It is extremely important for each of us to honour being fair, transparent and ethical in our conduct. Our philosophy of 'Extraordinary Together' is not only about the way we approach our business, but also encompasses the society. Our quest to contribute towards a better society starts with creating content that inspires, motivates and challenges the status-quo. Through our content, we have been able to shine the spotlight on issues that matter. While our entertainment content brings people together in a special way, our CSR initiatives aim at bringing positive changes in peoples' lives. We hope to make a positive impact so that we can live in a society where everyone has equal opportunities. Once again, I would like to express my gratitude to everyone who has played a pivotal role in helping us get this far. With a renewed faith and sense of purpose, we make our way towards the future. As we write the first chapter of this new era, our dream is to be Extraordinary Together. 2017 Zee Entertainment Enterprises Limited.